Located in Cherry Hill, New Jersey is a place where those in Camden County seek new and used office furniture at discount pricing—the Office Furniture Outlet aka Joe Desk Office Furniture Outlet! A visit to their showroom on Springdale Road is just the ticket for all types of businesses and organizations looking to find affordable office desks, tables, chairs and more. 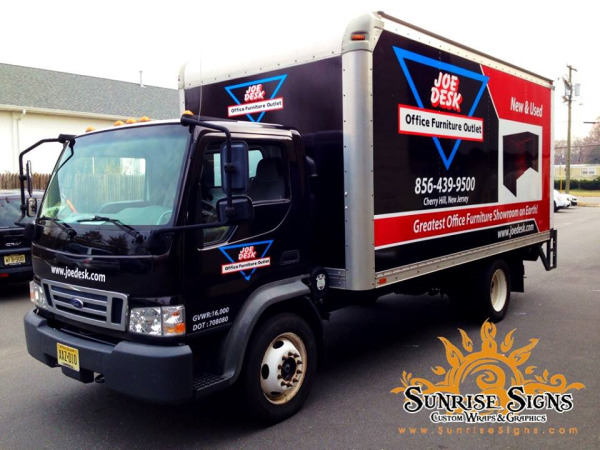 To help build their brand, this furniture company asked Sunrise Signs to be a part of their full box truck wraps project and we were happy to help.